intervention from that direction in the forthcoming Marianas operation.5 Thus, with all possible routes of enemy aerial interception from the south, east, and northeast successfully interdicted, Task Force 58 was assured a relatively free hand to deal with Japanese airpower based on the Marianas themselves. the fact that the 11 June bombing was not merely another hit-and-run strike but the beginning of an invasion. 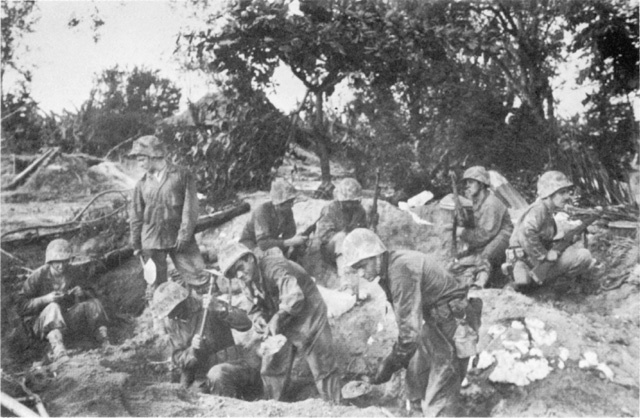 If it had suspected an immediate invasion, the Army command on Saipan would not have diverted to a long-range project when men and material that could and should have been devoted to emergency fortifications. Early on the morning of 14 June, Rear Adm. Jesse B. Oldendorf arrived off the coast of Saipan with the two bombardment groups that would carry the main burden of naval gunfire support both before and during the seizure of the island. This force consisted of seven old battleships, eleven cruisers, twenty-six destroyers, and a few destroyer transports and fast mine sweepers.22 The battleships had all been commissioned between 1915 and 1921.23 Four of them, California, Pennsylvania, Maryland, and Tennessee, were survivors of the attack on Pearl Harbor.24 All had undergone the rigorous training program for shore bombardment set up by V Amphibious Corps at Kahoolawe Island in the Hawaiian Islands. These ships were able to move into closer range than had the fast battleships in the previous day's bombardment. Mine sweepers had reported the area to the seaward of two miles from the shore line free of mines and were steadily moving in closer to the reef line. Better results were reported from this day's activities, and many installations were believed to have been directly hit, in spite of the facts that the time allowed for deliberate pinpoint fire was too short and that air spotters again revealed their lack of training in distinguishing important land targets. 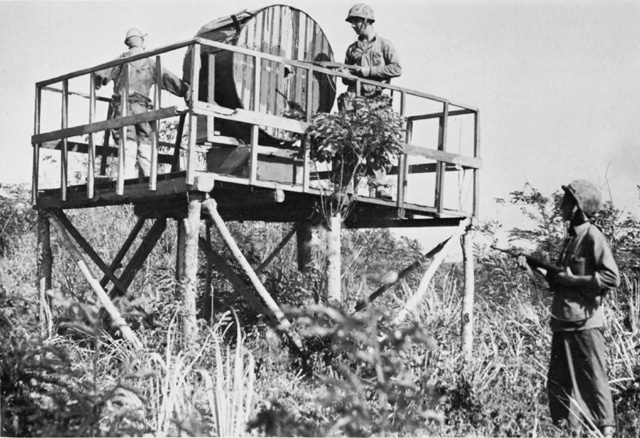 DUMMY SEARCHLIGHT PLATFORM ON EAST COAST OF SAIPAN. False positions such as this effectively diverted some air and sea bombardment from genuine defense positions. JAPANESE TYPE 96 25-MM. MACHINE CANNON. U.S. marines repaired this damaged twin-mount weapon fitted with speed ring sights and promptly put it to use against the enemy. shells fired by the naval ships left in the area. Shortly after 0500 the gigantic convoy moved into the transport area off the west coast of Saipan. In the early dawn, Mount Tapotchau lay silhouetted in the east. Streaks of fire from the armada of naval support ships colored the sky and the shore was blurred in a haze of smoke and dust. As the light improved, the town of Charan Kanoa became visible. To the north lay Garapan, the capital city. In its harbor, called Tanapag, lay several Japanese ships, beached, half-sunken, and smoking. Naval bombardment commenced about 0530. Heavy close support ships were ordered not to approach closer than 1,500 yards from the reef. Destroyers were permitted to move in as far as 1,000 yards. Two old battleships, two cruisers, and seven destroyers were assigned the duty of last-minute preparation of the landing beaches themselves.31 At dawn these ships took station and shortly thereafter the two battleships commenced main battery fire at the beach defenses; less than an hour later the two cruisers opened up with their 12-inch guns. At 0545 the word was passed throughout the American task forces that H Hour, the moment at which the first troops were supposed to land, would be 0830, as scheduled. Guns and winches were manned; boats were lowered into the water from the transports. Shortly after 0700 the thirty-four LST's carrying the Marine assault battalions moved into position and dropped anchor about half a mile off the line of departure. The line, the starting point from which the assault landing craft would take off, was located 4,250 yards offshore. Bow doors swung open; ramps lowered, and hundreds of amphibian tractors and amphibian tanks crawled into the water and commenced to circle. In all, 719 of these craft would be employed in the operation. most of which would be landed in DUKW's. Still further seaward of each division's beach lay two dock landing ships embarked with heavier landing craft (LCM's) that would take ashore the tanks and heavy artillery as soon as enough beachhead had been secured by the infantry.35 About 18,000 yards offshore the larger troop transports swung at anchor. Aboard were reserve troops, headquarters troops, shore party teams, heavy artillery, trucks, tractors, bulldozers, and sundry equipment and supplies. Meanwhile, north of the main transport area, marines of the 2d Regimental Combat Team (2d Marine Division) and the 1st Battalion, 29th Marines, were conducting a diversionary demonstration off the town of Garapan. Boats were lowered, troops embarked, standard waves were formed and went in as far as 5,000 yards off the beach. There they circled for ten minutes without receiving any fire and then returned to their mother ships. AMPHIBIAN TRACTORS IN LINE ABREAST FORMATION churn toward Saipan's beaches. strafing attack by seventy-two carrier-based planes commenced when the leading waves were 800 yards from the shore line, continued until the first troops were within 100 yards of the beaches, then shifted to 100 yards inland until the first landings were made. From the line of departure to the reef the first waves moved in good order and met only moderate enemy gunfire. Once across the reef, however, the picture changed. All along the line the Japanese opened up with automatic weapons, antiboat guns, and artillery and mortar barrages against the first wave. These increased in intensity as the second, third, and fourth waves climbed over the reef. In the 2d Marine Division's zone, three amphibian tanks and four tractors were knocked out of action between the reef and the beach.39 Surf in the area ran as high as twelve to fifteen feet, too high for amphtracks to operate with any great degree of safety. Nevertheless, only two capsized as a result of the swells. About 98 percent of all the tractors got ashore safely. The first assault waves of the 8th Marines landed on the GREEN Beaches at approximately 0843; the last were being landed by 0900. On the RED Beaches the first assault wave landed at 0840, the last at 0908. CONGESTION ON 2D MARINE DIVISION BEACH, the result of the right-flank battalion landing north of its assigned area. Note disabled LVT(A)(4) at upper right. From the outset, two factors marred the smooth execution of the landing plan. The first was the wide gap that had developed between the right battalion (2d Battalion, 8th Marines) of the 2d Marine Division and the left battalion (3d Battalion, 23d Marines) of the 4th Marine Division. The landing plan had provided for a gap between the two divisions. Troops were not to land on Afetna Point itself because of the reasonable fear that the enemy would have placed his heaviest concentration of artillery there to guard the only channel through the reef to the pier at Charan Kanoa.44 However, the distance between the two divisions was more than double that envisaged because the 2d Battalion, 8th Marines, landed north of its assigned beach. Almost three days would elapse before firm contact between the divisions was established. the LVT(A)'s were underpowered and were stopped by sand, trenches, holes, trees, and other minor obstacles, most of which a land tank could have negotiated with ease.48 Once the tractors were out of the water, their hulls were exposed and they became easy targets for enemy fire, which their armor was too light to resist. On shore they were clumsy and slow. It proved far healthier for troops to extricate themselves from these death traps as fast as possible and find shelter in whatever natural protection the terrain and the vegetation offered. that landed below Charan Kanoa had to fight swampy ground, tank trenches, heavy artillery, a burning gas dump, and a steep railroad embankment before attaining the ridge. Nineteen made it. Those on the extreme right had the most difficulty. Swinging south, three tanks reached the tip of Agingan Point about a thousand yards south of the lowest landing beach. They braved it out against fairly heavy Japanese mortar and artillery fire, but when American naval shells commenced to drop in the area they discreetly withdrew.52 Agingan Point would have to wait another day for capture. On the southern (YELLOW) beaches, where the fighting was fiercest, no such progress was made. One company of the 773d Amphibian Tractor Battalion got as far as a railroad spur about 700 yards inland, but the rest unloaded their troops as rapidly as possible and shoved off back to the transfer line beyond the reef. In spite of the hasty withdrawal of most of the first group of LVT's, the shore line soon was thick with tractors as succeeding waves telescoped onto the beach. It was small wonder. After a full hour's fighting the 1st Battalion, 25th Marines, had succeeded in pushing just twelve yards in from the beach, and the 2d Battalion's progress was only a little better.54 The tractor plan failed most signally here. The infantryman was on his own. On the RED Beaches to the north, the two assault battalions of the 6th Marines met fierce enemy fire immediately upon landing. The failure of most of the amphibian tanks and tractors to proceed any considerable distance inland and the rain of enemy shells caused unexpected congestion and confusion on the beaches.55 The command posts of both battalions received direct hits that seriously injured battalion commanders and most of their staffs. The regimental commander, Col. James P. Risely, USMC, came ashore at 1000 and established his command post practically at the water's edge. Forty minutes later the regimental reserve (1st Battalion, 6th Marines) commenced to land and prepare to support the assault elements. and the 1st Battalion was therefore ordered to pass through the 3d. Weak points began to appear all along the line. More serious, a dangerous gap developed between the right flank of the 6th Marines and the left flank of the 8th Marines when the 6th Marines landed some 400 yards north of its assigned beaches. In spite of the fact that Companies K and L of the 6th Regiment were ordered to establish physical contact, a gap of 300 yards still existed, although covered by fire. 1, although it was under heavy fire all the way. Once on the beach, enemy fire forced the crew to abandon the tank, but a reef route was marked and by 1300 the first of the 2d Division's tanks had landed on GREEN 1 and moved northward to support the 6th Marines. By midafternoon those tanks assigned to the 8th Marines had successfully landed and were in operation. Southward, on the GREEN Beaches, the chief problems facing the 8th Marines were confusion and congestion. The right flank battalion (the 2d) had landed from 700 to 1,000 yards north of its assigned beaches. 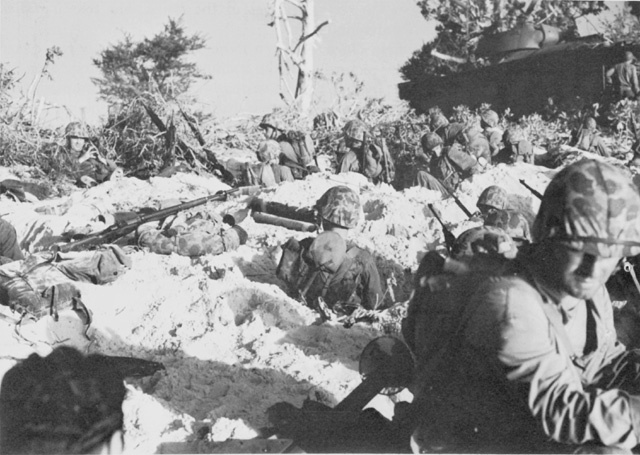 As a result, the two assault battalions of the 8th Marines and part of one battalion of the 6th Marines all found themselves in the same beach area. To add to the confusion, the commanders of the two assault battalions of the 8th Marines were both wounded early in the action and had to be evacuated. The 2d Battalion, 8th Marines, had the most difficult job--to attack south along the beach toward Afetna Point. The object was not only to remove the menace of antiboat weapons located in that area but also to secure the single reef channel off Charan Kanoa and permit the early entry of tank-carrying landing craft, which could not negotiate the reef itself. According to their prescribed scheme of maneuver, one company (Company G) moved south along the beach and the other two (E and F) fanned out to the southeast. Company G was heavily armed with shotguns in addition to its normal weapons. These short-range guns with wide dispersion patterns were allotted to Company G chiefly as insurance against its firing into the lines of the 4th Marine Division toward which it was advancing. Progress was slow--the beach itself was thickly covered with pillboxes, and enemy riflemen situated east of the Charan Kanoa airstrip made the most of the flat, open terrain to harass the company's left flank as it inched southward. At 0950 the 1st Battalion, in regimental reserve, was ordered to land. Company B was attached to the 2d Battalion to support Company G's attack toward Afetna Point. Companies A and C were committed between the 2d and 3d Battalions. MARINES DIGGING FOXHOLES, checking weapons, and keeping a steady watch. D-DAY COMMAND POST a captured Japanese gun position in the RED Beach area. South of Afetna Point, the 4th Marine Division was having it own share of problems.59 To be sure, opposition in the town of Charan Kanoa was comparatively light. Japanese riflemen sniped away as troops and tractors moved through the rubble of the town, but they caused small damage. The 3d Battalion, 23d Marines, reached the first objective line with phenomenal speed. On its right flank, however, the 2d Battalion of the same regiment was not so lucky. Troops debarked from their tractors unevenly and there was no semblance of a continuous line. Fighting degenerated into a series of small unit actions, and not until midafternoon was tactical control regained by the battalion commander. The farther south, the worse the situation became. After a full hour, the 25th Marines had penetrated only twelve yards in from the beach. From its right flank the 1st Battalion caught the heaviest load of fire from pillboxes and mortars on Agingan Point. Amphibian tanks, bombs, and naval shells were unable to abate this nuisance for the remainder of the day, and at nightfall the 1st Battalion, 25th Marines, had to dig in with its right flank exposed. By darkness of the first day it could be concluded that the landing was a success, even though only about two thirds of the area within the first objective line was under the marines' control. In spite of the failure of the initial plan to carry some of the assault waves 1,500 yards inland aboard amphibian tractors, the troops had established a beachhead approximately 10,000 yards in length and over 1,000 yards in depth in most places. Two divisions were ashore with almost all their reserves. Seven battalions of artillery had landed, as had most of the two tank battalions. Both division command posts were ashore by the time the troops had dug in for the night. The most serious weaknesses in the Marine position were on its flanks. Afetna Point, between the two divisions, was still in enemy hands. So was Agingan Point on the right flank, and the 6th Marines' hold on the extreme left was precarious. Although the enemy realized that the diversionary maneuver off Tanapag was a ruse, he did retain one infantry regiment (the 135th) in that area instead of committing it, as was intended, to the south of Garapan. At no time on D Day did the Japanese employ infantry in any great strength. They relied almost entirely on artillery, heavy weapons, and scattered tank attacks. 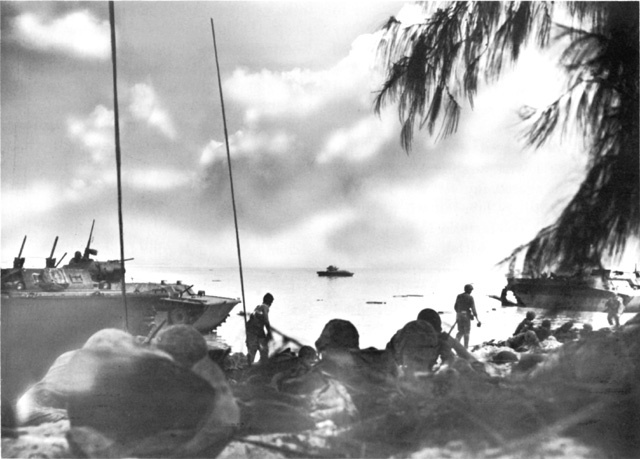 In the opinion of Holland Smith's operations officer, the "most critical stage of the battle for Saipan was the fight for the beachhead: for the security of the landing beaches, for sufficient area into which troops and heavy equipment could be brought, and for the ability to render logistical support to those forces once landed. "66 This, to be sure, could be said of any amphibious landing where strong opposition is encountered. On Saipan, it was six days before the beachhead could be considered completely secured, but it was the first day's action that was crucial. The most critical stage of "the most critical stage" was past. 1. CINCPAC-CINCPOA Opns in POA--Jun 44 Annex A, p. 28. 3. See Craven and Cate, AAF IV, pp. 684-87. 5. Lt. (j.g.) A. O. Van Wyen and Lt. (j.g.) W. G. Land, Office, DCNO, Naval Air Operations in the Marianas: 20 June 1944, pp. B-10--B-17, copy in Records and Research Sec, Hist Br G-3 Hq USMC. 6. Ibid., pp D-1--D-4, D-6; Comdr Fifth Fleet to COMINCH, Initial Rpt on Opn to Capture the Marianas, 13 Jul 44. 7. CINCPAC-CINCPOA Trans 10238, Extracts From the Diary of Matsuya Tokuzo, 9th Tank Regiment. 8. CINCPAC-CINCPOA Trans 9378, 43d Division Operation Orders, pp. 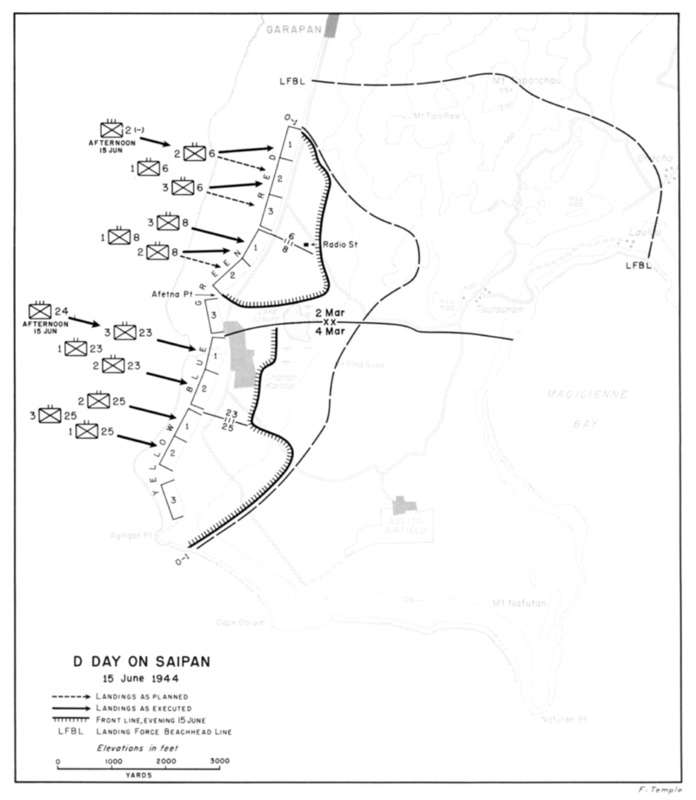 27, 28, 29 (Saipan, Jun 44). 9. CINCPAC-CINCPOA Opns in POA---Jun 44, Annex A, p. 30. 10. Van Wyen and Land, Naval Air Operations in the Marianas, pp. C-2--C-5. 12. CINCPAC-CINCPOA Opns in POA--Jun 44, pp. 30-31. 13. JANAC, Japanese Shipping Losses, pp. 12, 60-61. Naval pilots mistook this torpedo boat, the Otori, for a destroyer and so reported it. (Van Wyen and Land, Naval Air Operations in the Marianas, p. C-27.) The error is understandable since the Otori, though less than half the size of a destroyer, resembled it somewhat in silhouette. Otherwise, American damage claims for this action erred on the side of modesty. Postwar studies indicated a total of fourteen ships sunk, whereas the official American Navy claim came only to ten. Van Wyen and Land, Naval Operations in the Marianas, p. C-27; JANAC, Japanese Shipping Losses, pp. 12, 60. 14. JANAC, Japanese Shipping Losses, pp. 60-61; Japanese Studies in World War II, 97, A-GO Operations Log, pp. 13-14, OCMH. The Joint Army-Navy Assessment Committee claimed that one of these, the Keiyo Maru, was sunk. Japanese sources examined since the war indicate that it was only badly damaged and was subsequently beached on Saipan. 15. JANAC, Japanese Shipping Losses, p. 12; Van Wyen and Land, Naval Air Operations in the Marianas, p. C-13; CINCPAC-CINCPOA Opns in POA--Jun 44, Annex A, p. 31. 16. CINCPAC-CINCPOA Opns in POA--Jun 44, Annex A, pp. 34-35, and Table XII, App. 1. 17. CINCPAC-CINCPOA Item 9983-85, translation of captured Japanese document, SONAE Staff Msg 1011. 18. TF 56 Rpt FORAGER, Incl G, Sec. 2, Rpt on Naval Gunfire Support, p. 10; NTLF Rpt Marianas, Phase I, Incl I, Sec. 3, Naval Gunfire Rpt, p. 5. 19. CINCPAC-CINCPOA Trans 10051, Extracts From the Diary of an Unidentified Japanese Soldier. 20. CINCPAC-CINCPOA Translations and Interrogations, Vol. 29, Trans B-1938, Diary of a Naval Officer, June-July 1944. 21. The consumption of five bottles of beer by three men is not as harmless as it would appear at first glance. Japanese beer is stronger than the standard Western brew and normally comes in bottles holding a little more than a quart. Also, Japanese are notoriously poor drinkers, with consumption and sobriety levels far below Western standards. This particular naval officer may have been an exception, for, as noted below, he resorted to stronger stuff on D Day. 22. CINCPAC-CINCPOA Opns in POA--Jun 44, Annex A, Table IV, App. 1. 23. Jane's Fighting Ships, 1944-45 (New York The Macmillan Company, 1947), pp. 438-46. 24. Morison, Rising Sun in the Pacific, pp. 106-08, 111-13, 117-19. 25. NTLF Rpt Marianas, Phase I, G-2 Rpt, 12 Aug 44, p. 86. 27. CINCPAC-CINCPOA Trans 15282, Tactical Lessons Learned on Saipan, by Captain Shimamura, Combined Fleet, Aug 44. 28. TF 51 Opn Rpt Marianas, Incl A, p. 5; CO USS California, Rev Rpt of Participation in Saipan Opns, 7 Jul 44, p. 9. 29. TF 51 Opn Rpt Marianas, Incl G, pp. 2-3. 30. CINCPAC-CINCPOA Trans 9983-85, 31st Army Msg File, Msgs 1012, 1015. 31. CINCPAC-CINCPOA Opns in POA--Jun 44, Plate XV, App. A. 32. CINCPAC-CINCPOA Trans 9983-85, 31st Army Msg File, Msg 1027. 35. LCM--landing craft mechanized--a shallow draft vessel, fifty feet long, equipped with a bow ramp and primarily designed to carry a tank or motor vehicles directly onto the beach. 36. This account of D-Day preliminary bombardment is taken from the following sources: CINCPAC-CINCPOA Opns in POA--Jun 44, Annex A, pp. 41-47; TF 56 Rpt FORAGER, Incl G, Sec. 2, pp. 40-41; 2d Marine Div SAR FORAGER, Phase I, Sec. V.
37. Army and Marine Corps nomenclature for these vehicles differed. In the Marine Corps they were designated "armored amphibians", in the Army, "amphibian tanks." The latter usage will be followed in this volume. LVT's were sometimes called amtracs or amphtracks. 38. This account of the organization of the ship-to-shore movement is derived from the following sources: TF 51 Opn Rpt Marianas, Incl C, pp. 2-3. COMINCH P-007, Ch. IV, p. 6, Diagrammatic Chart Showing Organization of Boat Waves, Saipan. NTLF Rpt Marianas, Phase I, Incl E, G-3 Rpt, pp. 13-14. Ibid., Incl H, LVT Rpt, with the following inclosures: Incl A, Rpt of 2d Amph Trac Bn, pp. 5-7; Incl B, Rpt of 5th Amph Trac Bn, pp. 2-3; Incl C, Rpt of 10th Amph Trac Bn, pp. 1, 4; Incl E, Rpt of 715th Amph Trac Bn pp. 1-3; Incl F, Rpt of 773d Amph Trac Bn, p. 5; Incl G, Rpt of 2d Armd Amph Tk Bn, pp. 1-2; and Incl H, Rpt of 708th Amph Tk Bn, pp. 1-2. 2d Marine Div SAR, Phase I, FORAGER, Part I, Sec. V, p. 1. 4th Marine Div Opns Rpt Saipan, Annex C, pp. 1-9. 39. NTLF Rpt Marianas, Phase I, Incl H, LVT Rpt; Incl A, Rpt of 2d Amph Trac Bn, p. 7; Incl E, Rpt of 715th Amph Trac Bn, p. 3; Incl G, Rpt of 2d Armd Amph Bn, p. 1. 40. Ibid., Annex G, Rpt of 2d Armd Amph Bn, p. 1. 41. Hoffman, Saipan, p. 50. 42. 1st Lt. Russell A. Gugeler, FA, 1st I and H Sv, Army Amphibian Tractor and Tank Battalions in the Battle of Saipan, 15 June-9 July 1944, 20 Jan 45, pp. 6-7, MS in OCMH. These figures differ from those given in the official action report of the 708th Amphibian Tank Battalion, which states that two of its tanks were overturned and three lost due to maintenance difficulties. The report mentions no direct hits. (NTLF Rpt Marianas, Phase I, Incl H to Incl Y, p. 1). The former figures are accepted as more accurate because the author of that account gives a detailed description of the LVT(A) casualties in the battalion as well as the names and actions of the personnel involved. 43. NTLF Rpt Marianas, Phase I, Incl H, LVT Rpt; Incl C, Rpt of 10th Amph Trac Bn, p. 4; Incl F, Rpt of 773d Amph Trac Bn, p. 5. 44. Information from Maj. Carl Hoffman, USMC, who commanded the right flank company (Company G) of the 8th Marines, to the author, 30 March 1950. 45. NTLF Rpt Marianas, Phase I, Incl H, LVT Rpt; Incl G, Rpt of 2d Armd Amph Bn, p. 1. The tractor control line should not be confused with the transfer control line, which was on the seaward side of the reef and marked the point at which troops and supplies would be transferred from small craft (LCVP's) to amphibian tractors. 46. NTLF Rpt Marianas, Phase I, Incl B, Rpt of 5th Amph Trac Bn, p. 5. 47. 4th Marine Div Opns Rpt Saipan, Annex H 23d RCT Rpt, p. 29; Annex J, 25th RCT Rpt, p. 3. 48. NTLF Rpt Marianas, Phase I, Incl H, LVT Rpt; Incl G, Rpt of 2d Armd Amph Trac Bn, pp. 8-9; Incl H, Rpt of 708th Amph Tk Bn, pp. 6-7. 49. Ibid., Incl G, Rpt of 2d Armd Amph Trac Bn, pp. 1-2; 6th RCT 2d Marine Div SAR, Phase I, FORAGER, Incl A, p. 1. 50. Gugeler, Army Amph Trac and Tk Bns at Saipan, p. 22. 51. Ibid., p. 10. 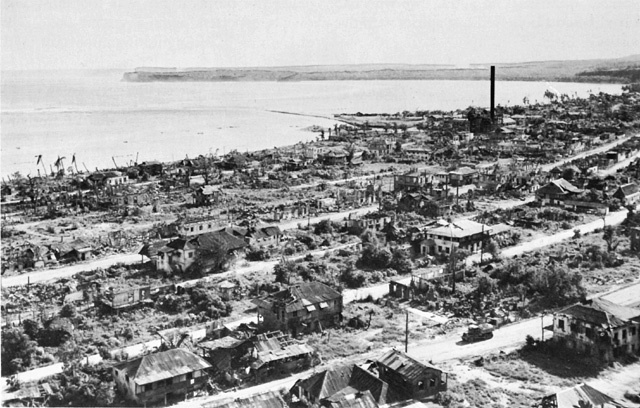 Gugeler states that thirty-three tanks reached the O-1 line, most of them by 1000. According to the action report of the battalion itself, forty tanks were on the O-1 line by 1000. NTLF Rpt Marianas, Phase I, Incl H, LVT Rpt; Incl H, Rpt of 708th Amph Tk Bn, p. 3. 52. Gugeler, Army Amph Trac and Tk Bns at Saipan, pp. 10-11. 53. NTLF Rpt Marianas, Phase I, Incl H, LVT Rpt; Incl C, Rpt of 10th Amph Trac Bn, p. 4. 54. 4th Marine Div Opns Rpt Saipan, Annex J, 25th RCT Rpt, p. 3. 55. The following account of D-Day activity in the 2d Marine Division's zone of action is derived from: 2d Marine Div SAR, Phase I, FORAGER, Sec. V, pp. 1-5; 6th RCT 2d Marine Div SAR Phase 1, FORAGER, Incl A, pp. 1-2; 1st Bn 20th Marine SAR Saipan, Incl A, p. 1; Hoffman, Saipan, pp. 51-55. 56. 1st Bn 29th Marines SAR Saipan, Incl A, p. 1. 57. 2d Marines 2d Marine Div SAR, Phase I FORAGER, p. 2. 58. 2d Marine Div SAR, Phase I, FORAGER, Sec. V, p. 5. 59. This account of operations in the 4th Marine Division's zone is derived from the following sources: 4th Marine Div Opns Rpt Saipan, pp. 13-15; Annex C, Opns, pp. 9-12; Annex H, 23d RCT Rpt, pp. 30-35; Annex I, 24th RCT Rpt, p. 18; Annex J, 25th RCT Rpt, pp. 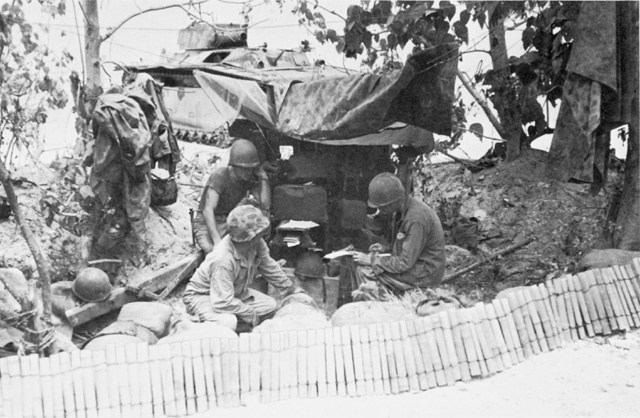 3-4; Annex K, Rpt of 4th Tk Bn, p. 3; Hoffman, Saipan, pp. 134-53. 60. This account of 4th Marine Division tank action on D Day is derived from: 4th Marine Div Opns Rpt Saipan, Annex K, Rpt of 4th Tk Bn, pp. 2-3; Hoffman, Saipan, pp. 143-48. 61. 4th Marine Div Opns Rpt Saipan, p. 14. 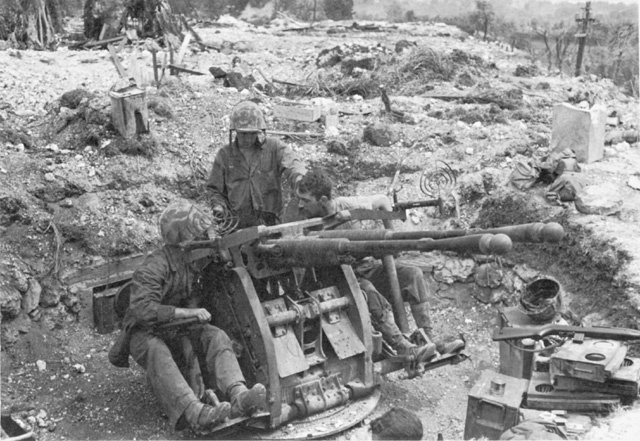 At the time of the Marianas Campaign, the Marine Corps artillery regiment was ordinarily composed of only four battalions, two of 75-mm. pack howitzers and two of 105-mm. howitzers. At Saipan, V Amphibious Corps attached an extra 105-mm. battalion to the 4th Marine Division and a 155-mm. howitzer battalion to the 2d Division. 62. 4th Marine Div Opns Rpt Saipan, Annex I, 24th RCT Rpt, p. 18. 63. Comments by General Schmidt on draft copy of this volume, OCMH. 64. 4th Marine Div Opns Rpt Saipan, Annex H, 23d RCT Rpt, p. 34. 65. TF 56 Rpt FORAGER, Incl D, G-2 Rpt, pp. 12-13. 66. Ibid., G-3 Rpt, p. 5.